The work of fellow blogger Gary, of Photos and a Little More, provided my introduction to the art and emotion of Stone Stacking. I soon learned that there existed a deep divide in opinion regarding the practice. Artists were supportive of it and environmentalists were dead set against it. 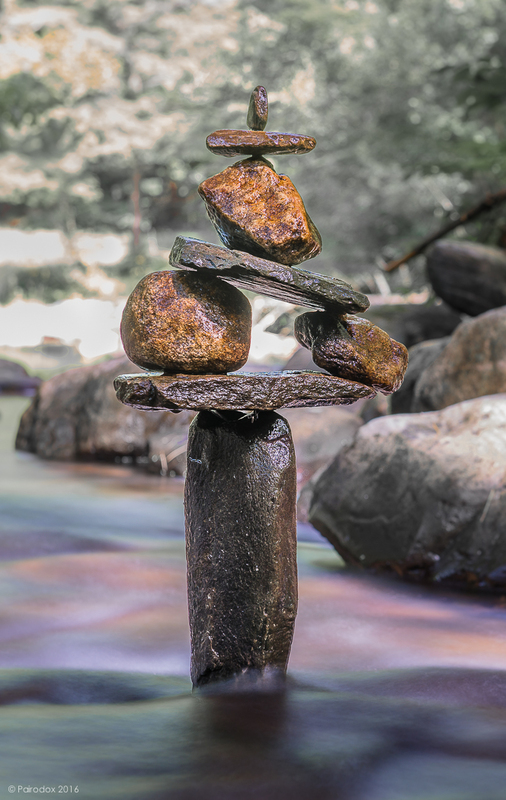 Stackers argue that not only is Rock Balancing a legitimate art form, but the practice has an emotional, even spiritual, component to it. Those who oppose the practice explain that stacks are not cairns (and could be dangerous if mistaken for them), they are pointless reminders of human ego, and lead to erosion of natural areas and to disturbance of the organisms living in them. I do not mean to imply that the opinions of these groups do not overlap, for they do, and I understand the concerns of both. She wanted to walk. So we made for a place we had visited before. I’ll meet you in an hour, she said. Having settled on a shallow cascade, I began. I hadn’t worked stone for quite a while and was surprised that it took time to find my hands. I pushed back against my propensity to rush. I struggled to focus and to avoid thinking too far ahead. She says that the steady rhythm of the wheel, the coordinated motions of her feet and hands, and the feel of fiber slipping by the tips of her fingers and wrist, combine to transport her to a place of peace. For me, stacking creates a similar sort of space and being there has given me some idea of what it might be like to meditate.